LOS ANGELES — The Golden Knights want a Stanley Cup title to conclude their already amazing inaugural season in the NHL. 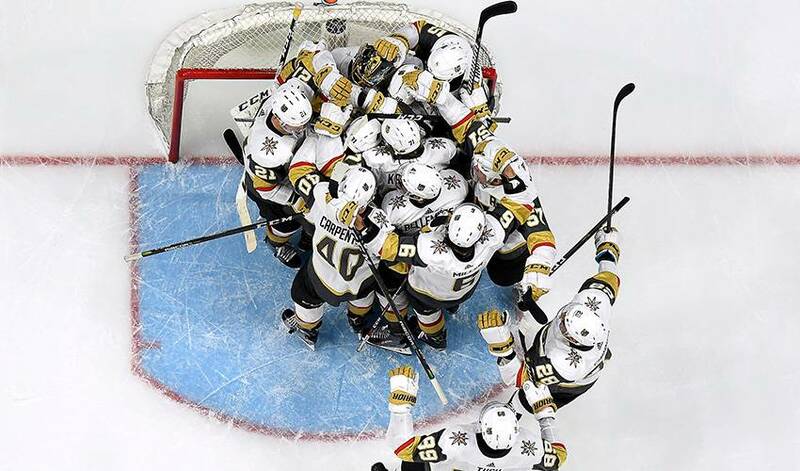 Vegas is on its way, beating the Los Angeles Kings 1-0 on Tuesday night and becoming the first expansion team in league history to sweep its first playoff series. "All season long, I didn't know any records about expansion teams," goalie Marc-Andre Fleury said. "We just do what a regular team would, we just play the game and try to win. That's it." Brayden McNabb scored against his former team in the second period and Fleury stopped 31 shots as the Knights finished off their fourth one-goal victory of the series. It was the goalie's second shutout of the playoffs. "I didn't picture this happening, me scoring a goal against the Kings," McNabb said, "but it feels real good to get this win and finish this series." The Knights poured into the net to hug Fleury at the final horn. Vegas fans in the crowd chanted the goalie's name in celebration. "We knew we were getting a superstar when we got him," Vegas coach Gerard Gallant said. "He has playoff experience and he's been a part of three Cups and he makes us better. LA put on the pressure on him but he was huge for us." McNabb scored from the right circle, beating Jonathan Quick's glove, at 4:04 of the second for his first career playoff goal. The Kings left the defenceman exposed in last year's expansion draft and the Knights snapped him up. The Kings pulled Quick in the closing seconds, when Dustin Brown skated straight toward the net and just missed. "That's what the playoffs are all about. It's so close," Kings centre Anze Kopitar said. "It's not like we were blown out of the water." Brown also hit the left post with 10 minutes to go in the third, typical of the close calls that failed to generate goals for the Kings in the series. They outshot the Knights 31-21 in the game. "It was crazy in the final minute of the game. They were buzzing around," Fleury said. "We had to keep pushing to the very end." Facing elimination, the Kings came out aggressively and outshot the Knights 14-8 in the opening period. Quick stopped two shots on goal during the only power play in the period when Adrian Kempe was sent off for hooking. "I thought our hockey team got better through the series," first-year Kings coach John Stevens said. "Tonight was our best game and created the most quality chances, just didn't finish off." Quick made 20 saves and allowed seven goals in the series, but he and the Kings couldn't duplicate the rally they pulled off in 2014. Los Angeles lost its first three games to the Sharks in the first round that year and went on to win the series and eventually the Stanley Cup. "We just got knocked out of the playoffs. I don't care what the score was," defenceman Alec Martinez said. "It's a lot of disappointment in this room. We can't forget how this feels." Vegas, the third expansion team since 1968-69 to clinch a playoff berth, awaits the winner of the series between Anaheim and San Jose, which the Sharks lead 3-0. The Kings managed just three goals in the series and lacked offensive punch from Kopitar (one goal) and wingers Brown and Tyler Toffoli (no goals). Brown fired a team-high six shots in the game, while Toffoli had three and Brown two. Toffoli took a puck to the face, drawing blood from his nose to his mouth. He got stitches and returned 10 minutes later. NOTES: Quick had a 1.55 goals-against average and a .947 save percentage. ... Fleury earned his 66th playoff victory, breaking a tie with Dominik Hasek for 11th on the NHL's all-time list among goaltenders. ... The Kings fell to 12-31 all-time in Game 4s. ... Retired Hall of Fame Kings announcer Bob Miller attended the game. Who has the best shot-stopping stats so far in the 2017-18 postseason? Hint: Three Washington Capitals made the cut. Which five current NHL backstoppers have the know-how to net their respective teams the ‘W’ when it comes to the biggest games? Marc-Andre Fleury is showing early in 2014 that he is still among the top-tier when it comes to NHL goaltenders. It's raining donuts in Las Vegas. The big day has come and gone.